“We have our boat back and she is still the same one that we got to know last time,” said Boat Captain, Graham Tourell. The 2014-15 edition of the Volvo Ocean Race proved one of the closest and most enthralling races yet. Teams finished within minutes of each other leg after leg despite sailing thousands of miles at sea. The introduction of the Volvo Ocean 65, the first one-design class in Volvo history, was the major factor behind this. Identical boats meant that the competition on the water was focussed on the sailor’s abilities, rather than the skills of the designers. The Volvo Ocean 65 will once again feature in the 2017-18 edition. 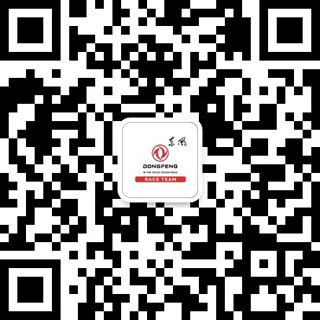 After a re-fit worth one million euros completed in February 2017, Dongfeng is ready for more match-racing in the Southern Ocean. Deck gear, electronics and a new media and navigation station is amongst the 500 plus items upgraded on the boat, alongside a new sail wardrobe. 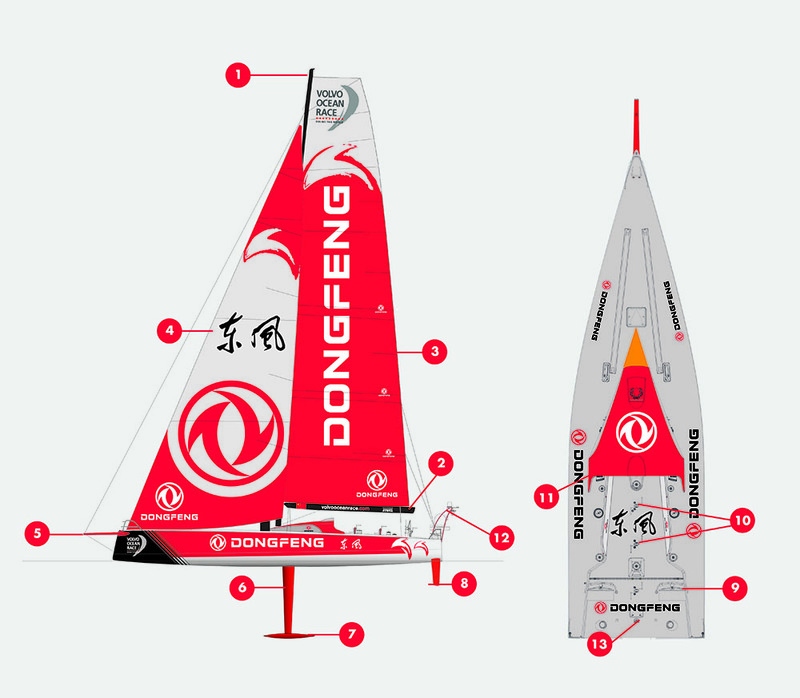 The Volvo Ocean 65’s will feature the same mast as in the last race but with a major overhaul. The carbon mast stands at a height of 30.3m (99.4ft) and a a diameter of 420mm. In the 2017-18 edition there will be an additional laminate added to the back of the rig, aiming to prevent any of the mast track problems experienced last race. The boom links the mainsail to the boat. This link allows the sailors to control the sheeting angle plus the slab reefing (when you reduce the mainsail as the wind increases). There are three lock boxes for reducing the main sail area as the wind increases, plus hydraulic outhaul to control the tension along the foot of the sail. This is the ‘engine’ of the boat that drives it forwards. It is the hardest working sail on the boat as it is up all of the time. Each boat receives two mainsails for the duration of the race so they have to look after them. In the 2017-18 edition, the main has had a luff curve re-cut which flattens out the mainsail without the need of bending the rig to reduce the draft. North Sails, the official supplier of the sails for the Volvo Ocean Race, work with advanced 3Di technology – a 3D moulding technique which gives the sails a flying shape. Total number of sails for the race: 12 + 1 pre-race storm jib. Total number of sails onboard: 8 + 1 storm jib. The sail on the front of the boat can range in size from the J3 all the way up to the A3 mast-head gennaker. At 2.14m (7ft), this is the attachment point on the front of the boat for the gennakers to be flown from (large downwind sails). This could also be considered the area for the adrenalin junkies - if you want to get buried in water and run the risk of being swept down the deck then bowman is the job for you. Twin asymmetric daggerboards are used in conjunction with the canting keel to improve the boats direction or stability. By canting the keel to 40 degrees, it would be the equivalent of putting a rugby team on the side of the boat to improve the boats performance. It can also be used to self right the boat in the event of a capsize. The keel and bulb together weigh up to 5, 241 kg which is approximately the weight of three rhinos. Twin rudders allow better traction when sailing the boat at high angles of heel. They also provide a redundancy should one get damaged. Twin steering wheels give the helm a better view when driving with an elevated position. As with the rudders, having two wheels also provides redundancy if one gets broken. There are three winch pedestals which all have the ability to be linked together. This allows for maximum drive to any of the connected winches. They can also be used independently. For example, the aft one will predominantly control the mainsheet plus sailing hydraulics. The middle winch pedestal can be used for trimming the jib whilst the forward one is mainly connected to the pit winch. Also known as the sailor’s front door, this is how sailors access the quarter below deck. The hatches can be sealed in the event of a capsize or can be replaced with washboards whilst sailing in rough conditions to prevent water washing inside the boat from the cockpit. The newly designed antenna farm, set to be a huge improvement from the previous version, carries all of the communications antennas plus a large portion of the safety gear such as life rafts and man overboard modules. This is the escape hatch in the event of a capsize. A new feature in the 2017-18 edition, the hydro-generator is a propeller which you drop over the back of the boat. It spins around with the water flowing, generating electricity which feeds the batteries on the boat. This will therefore act as a back-up power source to the Volvo Penta engine. Fixed camera positions and microphones on board. New cameras have been added to the bow and spreader for the 2017-18 edition. Lightweight bunks, a basic toilet, a two-burner hob to heat freeze-dried food and a nav station where the race strategy is planned.